Oak Ridge Military Academy traces its origins to 7 Apr. 1850, when local citizens "desirous of promoting the cause of education" met and appointed a board of trustees to secure funds to erect a schoolhouse. Virtually everyone in the northwestern Guilford County community of Oak Ridge contributed to the total of $629. The school, originally named Oak Ridge Institute, opened on 3 Mar. 1853, with a classical curriculum of 18 courses and 63 students from North Carolina and Virginia. By 1856 it had 85 students, roughly three-quarters of whom were from places other than Oak Ridge. The entire Oak Ridge Institute student body volunteered in 1862 for service in the Confederate army, which necessitated the school's temporary closing. Shortly after the end of the Civil War, the school faced extinction when the main building burned to the ground the day before classes were to begin in September 1865. Classes were held in a nearby log cabin while supporters rallied to keep the school open. By 1875 J. Allen Holt had become principal and began an expansion program. 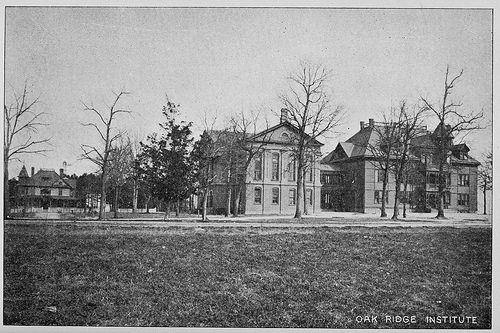 In 1899 Oak Ridge Institute became the first secondary school in North Carolina to be accredited by the Southern Association of Colleges and Secondary Schools. By 1901 it had 259 boarding students and claimed to be the largest "preparatory and fitting" school in the South. A junior unit of Army ROTC was established at Oak Ridge in 1926, making the U.S. Army the only organization with which the school has had any official affiliation. Since that time it has become in essence a military school that has repeatedly received high marks from army inspectors. In 1971 the school's name was changed to Oak Ridge Military Academy. That year it also became one of the first military academies in the United States to admit females. (Women had been in attendance earlier, prior to its becoming a military school.) The goal of the academy, which enrolled students in grades 7 through 12, became preparing students for college, and at the end of the twentieth century Oak Ridge offered a guarantee that "every cadet who graduates from Oak Ridge is accepted to college." The General Assembly designated Oak Ridge Military Academy the "official military academy" of North Carolina in 1991. Its 101-acre campus is a National Historic District. Virtually all of its 11 major buildings, some of which date from the 1914 reconstruction of the school, were remodeled in the early 1990s. The exceptions were Linville Chapel, built in 1914, and the Holt infirmary, built in 1938. William P. Pope, "The Spirit of '66," The State (15 Aug. 1970). Oak Ridge Institute. From the 1896-1898 Biennial Report of the Superintendent of Public Instruction of North Carolina from the State Library of North Carolina. Available from http://www.flickr.com/photos/statelibrarync/6812190101/ (accessed September 17, 2012).